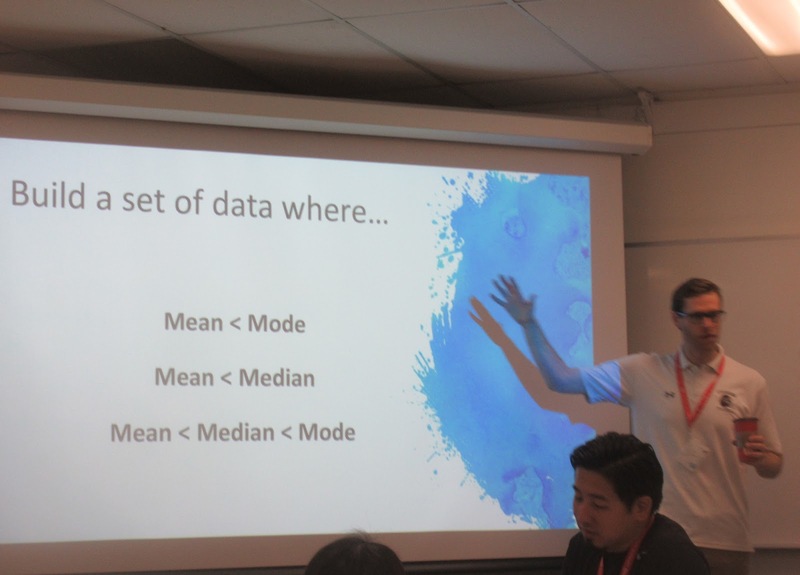 If you missed the OAME Conference Day 1, you can find it at this post - it included a look at mindset, data activities and more. Here's the second day, along with a BONUS at the bottom. 1) "Teaching Mathematics With Open Tasks", presented by Nat Banting (from Saskatchewan). Good open tasks are a balance between freedom and constraints. Certain freedoms can be constrained, like using vertical surfaces - it's about "tinkering with this balance". Nat considered a few counterpoints like "Objects and Objectives", "Prescriptive versus Proscriptive" ("You HAVE to do this" versus "You CAN'T do that") and "Deficiency versus Sufficiency". We began with a simple question: Which is larger 5/7 or 4/5? Now remove an object (not the objective): Create three fractions larger than 5/7. Using the digits 0 to 9 at most once each. This creates freedom. Of course, 6/7 is an obvious choice, so we can then constrain: "You cannot use 7". Then there's freedom, how many numbers larger can you make? (Only four?) What about zero? (Handle zero in a different way?) So that's a good problem... perhaps? "It's a hindsight thing." How about: Given these specific 20 numbers (some digits were repeated more than others: 1, 1, 1, 1, 2, 2, 2, 3 ,3, 3, 4, 5, 5, 6, 6, 7, 7, 8, 9, 10), create the ten largest fractions you can. Note NOT "how many fractions" (in on one pole, out on another). Maybe this problem is too open? "Open is not [necessarily] better." The problem you give is not always the problem kids are working on (taken a different direction). Though constraining does mean less freedom, that's NOT less activity. To illustrate that, after a bit of time to work, Nat came out with "I'm from Manitoba, I'm so sorry, first time here - no improper fractions allowed". Which led our group to the question, is 3/3 improper? Another constraint: "No duplicates". (So is 1/2 = 2/4 a duplicate? "No equivalent fractions.") We're narrowing in on terminology. (Language should come from necessity.) Also, "7" becomes a much nicer number, it won't reduce. That said, curriculum and time are probably the biggest constraints on teaching. Don't pretend they're not there. "Teaching is a present tense enterprise. If you think otherwise, you'll be very surprised or disappointed. (And probably underprepared)." Does ten large fractions always create the largest sum? There were some other questions in Nat's slides, like building a set of data with requirements on the mean, median and mode. In the end, it's hard to know what you push. Regarding deficiency versus sufficiency, it's not about how did they solve the problem, more what problem are they solving. Here was the first keynote I hadn't seen before - though I WAS aware of the "Global Math Project" and the concept of exploding dots, if not the specifics. ("Global Math Week" started on October 10th, 2017.) James Tanton offered up an "International Math Salute", ending up turning his thumbs parallel on his left without rotating them; it was a matter of knowing where you wanted to end up as you began. Life lesson: "If there's something in life you want, make it happen. And deal with the consequences." Illustrating this, James began with "a story that's not true". (Math is a story.) He spoke of playing as a young child with a "two to one" machine, visualizing a row of boxes. When you have two items you can explode and go left. In math we speak, of course, using the ten-one machine (-ty means ten, as in six-ty). In English, we read from left to right - but addition takes place from right to left. Consider 528+693. That's "eleven hundred, eleventy eleven". There's nothing mathematically wrong with that answer, it's just society thinks it's weird. Society is fickle! Why can we say "12 hundred" for 1200? There's a reason ESL might have trouble with "twenty" (two-ty?). Back to the machine, we have exploding dots, what about annihilation, "not" explosions. We have open circles, tods. Style does unexplosions to start. Consider 523-145. "Math doesn't care what base we're in." (Our obsession is with ten-ness.) Funny enough, when we get to long division, NOW we do math left to right. James continued to illustrate the functionality of his "row of boxes" machine. Then we came to polynomials, x^3-3x+2 divided by x+2. James said this method FAILS, as we want to unexplode (use tods) but we don't know the number of dots to create when that happens. Except he was lying, and demonstrates that it is possible. The simple place value technique can be used as high as senior math courses. From the keynote, I went to *LUNCH*, and my brain break. 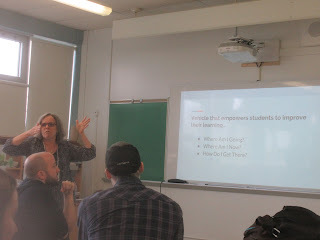 3) "Shift Your Approach: Using Open-ended Questions to Improve Problem-Solving and Thinking Skills", presented by Laura Gatey (Dept Head, Halton DSB). This session is from someone teaching at the high school I went to back in the 90s! One look at open ended questions is working backwards: "Create a discount problem where the final cost, after taxes, is between $150 and $160." (We tried this one ourselves.) Everyone could have a different question. Some student solutions were shown when this inquiry question was posed in a class, and we discussed. They've been trying this out, and debriefing. Next steps, from an open question, let students create the rubric? Level 4 is so broad... don't create a big range, don't spend tons of time creating a detailed rubric. There will be surprises anyway, don't put output in a box. Depending on audience, come up with a wrong solution; have an intersection (a,2a). Also oral evaluation, pick a question, 5% off exam. The final performance task (sample rubric provided) was for 2 days, with the 3 questions per day. It's a mix of expectations (system of equations, a 2D area expression having a y^2 term, a line equation that's answered y = 2/3x - 8). Other sample work was shown, and there was a chance for questions. 4) "Being with/in a professional learning network. How do you MTBoS? ", presented by Judy Larsen (associate prof, University of the Fraser Valley). 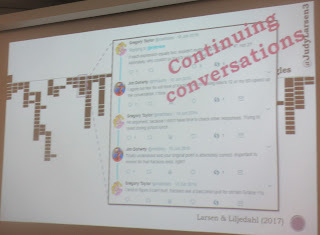 You can find Judy Larsen @JudyLarsen3; I was curious about how the "Math-Twitter-Blog-O-Sphere" would be presented, and was surprised to find that I was a later example. First though, the idea of Twitter, with many useful hashtags, and realizing a dream of visiting teachers online when you can't do it in the actual world. 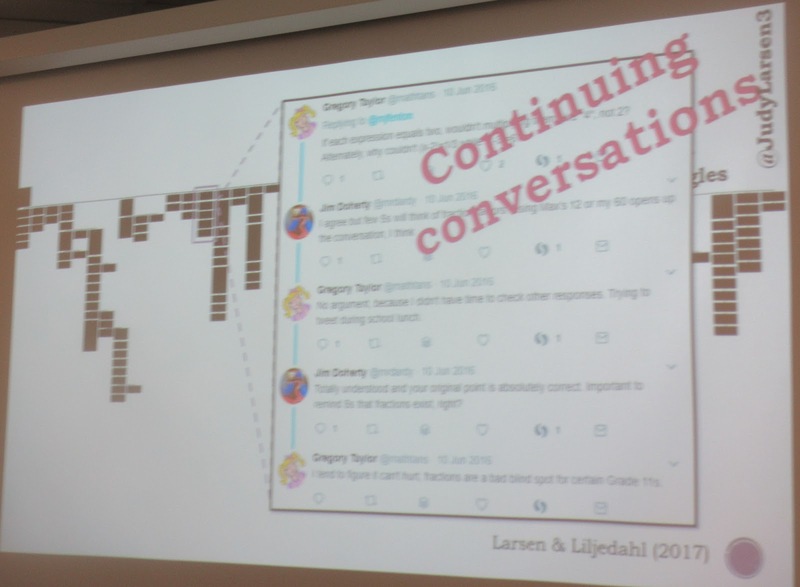 A @gfletchy tweet was analyzed, involving putting in digits to make _ _ + _ _ = _ _ + _ _. We worked in groups, place value became an interesting thing, because it meant some possibilities could simply reverse the existing digits, but not always. (Our group came up with a place value one at the start, actually.) We also looked at a @mfenton tweet, how to address (x-2)(x-3) = 2. Amusingly enough, my answer in the present roughly matched my tweeted answer from a couple years ago - so I'm consistent? There was also the question of "How is interacting online different than face to face?". Some responses included having to wait for a response (if/when it comes), and that it's more diverse (though you can also get the same responses from different people). It's also a record in progress, not audible, evolving. Then there's brevity and focus in the Twitter medium. What does it take to belong to this sort of community? "It's a sea." Judy also had graphed together two weeks of MTBoS tweets, in a network. Removing the ReTweets generated a new visualization. There were pockets. There's also the "iteachmath" hashtag. But it's a place for Questions, and one shouldn't be afraid to speak up. When that session ended - that was OAME 2018. The drive home was a lot smoother than the trip there. (In part as I did not spend it trying to write a serial entry, like in 2017, as Virga's cases were running.) As a bonus, I present below our District PD, which occurred one week previous, on April 27th in 2018. For reasons (normally it's in February). The PD began with theme based open sessions on such topics as "Incorporating Technology", "Assessment", "Manipulatives", "Thinking Classroom", and then subject specific areas. As usual, I hung out in the Data Management area. Also there, Iryna Tsvirinkal, Jovan Stankovic and Bradley Pinhey. The two 75 minute sessions I signed up for that followed were "No Small Dream" (11am) and "Help! My Math Students are Marks Obsessed" (1pm). "No Small Dream" was a presentation by Robert Tang (Lisgar). His description quoted "Dream no small dream. It lacks magic. Dream large. Then make the dream real." by Donald Douglas. Something he's been able to do is create activities for various grade levels to work on, most recently a scenario based on "The Martian", with people trapped on Mars. One class was like the people on Mars, having to deal with that situation, another class was NASA working things out - oh, and all this took place during a day at the Aviation Museum. He's been working on these sorts of things for a while (they did rockets one year), and now can even get sponsorships to help have things like space suits (for going outside and setting up 'solar panels'... meanwhile inside they had to detect a leak). While some curriculum concepts tie in more neatly, there's also the "solve certain problems to get a password" sort of question too. "Help! Marks Obsession" was a presentation by Robin McAteer (Bell) and Andrea Bortnowski (Earl). Their description included the remarks: "We want to empower our students in learning behaviours such as reflection, self-assessment and self regulation. We designed a portfolio assessment where students select and document artifacts of their learning, and identify their own strengths and next steps." Samples of these were shown around the room, along with student work. Success criteria were listed (such as "I understand the concept of conditional probability" for data), with an area for self-assessment (red/yellow/green) and for which "Item" in the portfolio demonstrates an ability to work with that criteria. We discussed in groups and then as a whole, to see how it can be implemented. And that's the whole post. Hope you got something out of it! If so, perhaps leave a comment, or if you have a question I can clarify or an extension you might implement. Either way, thanks for reading this far down. Hope to see you at OAME 2019? It's in Ottawa, where I am! Appreciate your recap! Love getting to learn a bit more about Judy & Nat's OAME sessions as well as Robin's PD session. Thanks!! !